Many of you are looking for work from home jobs that pay $10 an hour — or preferably more. This is yet another popular question I get from readers who are looking for home-based work, and it makes sense. Although you do save money in all kinds of ways by working from home, it's still hard for most people to get by on anything less than $10 an hour these days. I've written about several work from home companies in the five years this blog has been online. While most of the companies I've covered pay per piece, per word, or per task, there are quite a few that pay hourly. Keep in mind that the majority of the hourly pay companies are phone jobs, so you're going to see a lot of those posted below. If you want to earn more than $10 an hour doing something like freelance writing, transcription, or short tasks, your speed is what will get you there since these jobs usually don't pay hourly. P.S. – If you like this info, please consider becoming a newsletter subscriber and/or following my Facebook page! I send out new work at home job leads and work at home updates via email weekly, and as a bonus, you get a list of 15 work at home companies hiring RIGHT NOW. VIPKid – Read VIPKid Review – Open to US and Canada. Tutors earn between $7-$9 per lesson with each lesson lasting approximately 25 minutes. Lyft – Read Lyft Review – Another job not done from home, but very flexible. You can become a driver for Lyft and give rides to passengers who request them via the Lyft app. You are totally free to set your own schedule and keep all your tips. Plus, there is an option to get your pay daily via ExpressPay, or get paid out weekly. Lyft is currently needing drivers for many cities nationwide. Many Lyft drivers earn around $15 hourly. Brainfuse – Read Brainfuse Review – US. Work from home tutoring. When you are tutoring students, you get $10 an hour. When you're waiting for students to sign in online and be tutored, you are paid $7 hourly. Crawford Media Services (Metaforce) – Read Crawford Media Services Review – Crawford Media hires contractors to do metadata writing and tagging for occasional projects. Pay is reported to be between $10 and $18 hourly. ETS – Read ETS Scoring Review – US. Work from home test scoring. Pay is between $10 and in some cases as much as $20 hourly. This position does often require teaching experience and some college or a degree. ICUC – Read ICUC Review – US and occasionally other countries. This is work from home community moderation. Pay is between $10 and $18 hourly depending on your experience. iSoftStone – Read iSoftStone Review – US only. Work from home search evaluation. Pays $12 hourly. Leapforce – Read Leapforce Review – US and other countries. Work from home search evaluation. Pays $13 hourly. Lionbridge – Read Lionbridge Review – Open worldwide. Work from home search evaluation. Pays $13.50 hourly. Measurement, Inc. – Read Measurement, Inc. Review – Open to US. Work from home scoring tests (temporary work). Pays around $11 hourly. Panda Tree – Open to US and Canada. Work from home tutoring students in Spanish and/or Mandarin. Pays $12 hourly or more. Flexible schedule. Pearson – Read Pearson Scoring Review – US. This is another test scoring company that pays $10 or more per hour. SmartBrief – Read SmartBrief Review – US only. This is shift-based freelance writing. They may pay their writers around $14 hourly. Stitch Fix – Read StitchFix Review – US, certain locations. Work from home as a fashion stylist, helping to curate boxes of clothing for StitchFix subscribers. May pay around $15 hourly. Tutor.com – Read Tutor.com Review – Open to US and Canada. Tutors earn $10 – $11 hourly while tutoring and $5.50 hourly while waiting for live sessions. With many work from home customer service companies, the hourly rate will vary because they often have different clients for their workers to service. When that's the case, your rate of pay may be different just depending on which client you've been assigned to. Still, most of the companies below seem to consistently pay at least $10 hourly if not more, although in rare cases it may drop below that rate just depending on the client you're handling calls for. 2U – Read 2U Review – US only. This job involves handling tech and customer support for students and faculty who are using 2U's online, cloud-based platform for lessons. The rate of pay isn't listed on the site, but Glassdoor indicates that almost all of the jobs here pay over $40,000 yearly, so it's most likely a $10+ per hour job. ABC Financial – Read ABC Financial Review – US only. This job involves handling customer service for people with accounts at health clubs. The rate of pay is not listed on their site, but someone left a comment on my review of the company claiming they were offered $10.50 hourly. Amazon – Read Amazon Customer Service Jobs Review – US only. Amazon usually pays at least $10 hourly for the home-based customer service positions, but this may vary a little depending on which state you live in. American Express – Read American Express Review – US and possibly occasional openings in other countries. They have a few different home-based positions available from time to time. The exact rate should depend on your experience, but should be over $10 hourly in most cases. Appen – Read Appen Review – Worldwide. The work from home search engine evaluation for this company may pay around $10 hourly. Apple – Read Apple Work at Home Review – US, maybe occasional openings in other countries. They hire people to work at home doing chat and phone support for their products. Pay rate is not listed, but rumored to be $14 hourly or more in most cases. Arise – Read Arise Review – Arise offers more of a home business opportunity since they require that you incorporate and go through lots of training/certification that you have to pay for prior to servicing their clients, but once you start working you can expect to earn between $11 and $13 hourly in most cases. Blooms Today – Read Blooms Today Work at Home Review – US only, hiring seasonally for work from home flower orders. If you work for them as an independent contractor, you make a flat $15 hourly. People who work from home as permanent employees (from what I understand not seasonal work) will make less but qualify for commission on sales they make. Blue Zebra Appointment Setting – Read Blue Zebra Review – US and Canada. This is cold calling work from phone. The website for Blue Zebra claims their home-based workers can earn between $15 and $25 hourly based on experience and skill level. Brighten Communications – Read Brighten Communications Review – US only, work from home telemarketing. Pay is reported to be about $12 an hour, but you could ultimately end up earning as much as $18 hourly. Capital One – Read Capital One Work From Home Review – US only, usually hiring in Florida and Virginia. The don't publicly advertise their rate of pay, but from what I've gathered it is over $10 per hour. A person posted a review of the customer service position on Glassdoor and claimed she would be earning $13.03 hourly. Still, this may vary from person to person. Carlson Wagonlit Travel – Read Carlson Wagonlit Travel Review – This is a travel company that has occasional openings for home-based workers to help with booking travel. Pay is $15 hourly. Causeworx – Read Causeworx Review – This is a Canadian company that hires people to do tele-fundraising for various Canadian causes. The pay between $11 and $14 hourly. Open to Canada only. Contemporary VA – Read Contemporary VA Review – This is a company that hires virtual assistants (who are fluent in English) from around the world. They pay all of their VA's $10 an hour. Open to the UK and the US. Cruise.com – Read Cruise.com Review – This is another travel company with occasional customer service openings. Pay is rumored to be between $10 and $15 hourly. Direct Interactions – Read Direct Interactions Work at Home Review – US only. Usually hiring people to work from home as parking enforcement agents (taking calls from people with unpaid parking tickets), although they may occasionally have other types of positions, too. During training, you make $9.35 hourly, but that will go up to between $10 and $12 hourly after training. People who are bilingual generally earn $11 or $12 hourly working for Direct Interactions. Enterprise Rent-a-Car – Read Enterprise Review – US only. They hire in many different locations nationwide for work from home. The rate of pay varies for each type of postion (customer service reps, reservation sales reps, and escalation support trainees), but hovers between $11 and $14-$15 hourly with reservation sales reps earning the least and escalation support trainees earning the most. Hilton Worldwide – Read Hilton Work From Home Review – US only, Dallas, Texas and Tampa, Florida. Pay is based on performance, but should vary between $12 and $15 hourly. HSN (Home Shopping Network) – Read HSN Work From Home Review – US only, usually hiring in St. Petersburg FL (727 or 813 area code), Roanoke VA (within one hour driving distance of their VA facility, in zip code 24012), and Nashville TN (615 or 931 area code). They pay $10-$11 hourly. Lifebushido – Read Lifebushido Review– Open worldwide. This company may pay their workers around $10 hourly. Neiman-Marcus – Read Neiman-Marcus Review – Currently this well-known company only hires customer service agents in the Dallas – Ft. Worth, Texas area to work at home. But if you're lucky enough to get the job, you'll earn anywhere from $11 to $16 hourly. They claim they will be expanding to other locations soon. NexRep – Read NexRep Review – If you do tech support for NexRep, they claim you earn a flat $10 hourly. 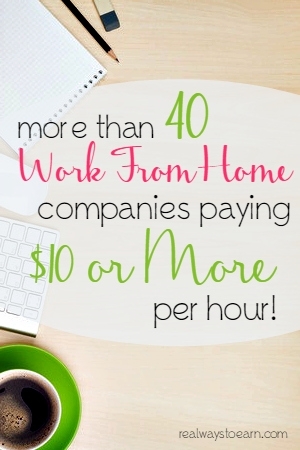 The company also has several other phone jobs you can do from home, but these pay less than $10 hourly. Some of the ones that pay less than $10 hourly are base plus commission, so when commission is factored in, it's possible you may average out to more than $10 an hour. NextWave Advocacy – Read NextWave Review – US only, political outreach calling and writing. For the phone work, pay is reported to be $12 an hour plus other possible incentives and bonuses. Project-based work. Paragon Planners – Read Paragon Planners Review – US only, work from home scheduling for financial wholesalers. I've read that you start out at $12 hourly but this may increase to $14 hourly as you gain experience. Red Butler – Read Red Butler Review – Work from home virtual assisting. They reportedly pay between $12 and $15 an hour. Rosetta Stone – Read Rosetta Stone Review – Work from home language coach. This is usually location-based. Pays about $17 hourly. Support.com – Read Support.com Work From Home Review – US. They have many different tech support positions open on a regular basis. The rate of pay may vary a little for each type of job, but when I reviewed the company I discovered that the remote services tech job paid $11 hourly. Someone did comment on that review and let me know the rate of pay had actually been lowered for the remote services tech job, but they didn't say to what — so it's possible they may no longer qualify to be on this list. If anyone works for them, please let me know if they pay less than $10 hourly and I will remove them. Time Etc. – Read Time Etc. Review – US & UK. Work from home virtual assisting. The pay is between $11 and $16 hourly depending on your experience. Williams-Sonoma – Read Williams-Sonoma Work From Home Review – Various locations in the US. They pay $11 hourly. It's location-based work at home because they require you to train onsite. World Travel Holdings – Read World Travel Holdings Review – US only, specific states. They occasional hire for home-based sales and customer care. The rate is not listed on the website, but from what I gather it is usually more than $10 hourly. Worldwide 101 – Read Worldwide101 Review – May be open worldwide. They hire work from home virtual assistants fairly regularly. Pay may be between $15 and $20 hourly. Hopefully this list is a good starting point if you're looking for some higher-paying work from home positions! Many of these (particularly the non-phone options) are jobs that pay $10 an hour with no experience. Please keep in mind that the above companies may or may not be hiring right this moment. Need More Than $10 an Hour? FlexJobs has been listed as the top site for telecommuting jobs on Forbes, CNN, USA Today, and several other reputable media outlets. You can go into Account Settings once you have your membership and set it up so it doesn't bill you for the next month if you just want to try it for a month and see how you like it. This is what I did, but I opted to keep my membership. It costs $14.95 monthly, and it's easy to cancel. You can use promo code AFFILPROMO to get 30 percent off. Very good information with thankfully. I might translate this to Thai language to share some useful information if you allow. You are welcome, and good luck to you! I from INDIA i want a data entry entry, Search etc where i can made about $10 per day from home. Are these mostly no experience entry lvl jobs? Because i’m looking for a no experience entry lvl job that pays $10 or more per hour or weekly and payment is through direct deposit or paypal and i’m having a hard time find such jobs. It’s a mix of entry-level and non-entry level. The only thing they all have in common is paying $10 or more hourly. You would need to click the links and read through the requirements for each job to see if it’s something you’d qualify for. I do know that Appen (listed above) is entry-level. And many of the phone jobs require little to no past customer service experience. Love your blog … always great informative articles. I work full-time for a pest control company; I’ve been here 5 years and love the people I work for. However, I also love my side-hustle. At night and on the weekends I am an App Developer. My website is http://www.bakersfieldbizapp.com. Even though Bakersfield is part of my business name, because that is where I live, I can develop apps for anyone anywhere. So … for anyone wanting to add this as a side hustle for themselves; I pay a $100.00 commission for each signed contract and I do all the work as far as development and publication. Great article, I work from home now but I needed more job ideas to build my income more than it is right now so thanks for this article it will surely help! I just wanted to say thank you so much for this article!! I was looking for a work from home position to take some of the pressure off my husband. I found you blog and applied at a bunch of the company’s listed and got a job!!! This was a life saver! Thank you again!! Which one did you actually get the job at? Because all of the ones I’ve tried aren’t hiring anyone right now. Cynthia, if you are not having luck with any of the above companies, you can check here to see a list of companies that are hiring recently: http://realwaystoearnmoneyonline.com/jobs I try to keep this updated several times a week. Thank you for your time and effort looking into these companies ! Have a blessed day say a prayer for me please , as I am disabled and need to work. I did go to collage for nine yrs to earn my Phd , however, it does not do me much good if I can not work. Have a very blessed day! Oh, I was wondering what u thought about places that hire u to get out different business? From restaurants , to stores etc. thanks! This is an amazing list, thank you for putting your time into compiling! I work for IMV Medical (IMVinfo.com) and it pays $15/hr. We survey hospitals about their equipment. Will you provide a contact for this position? I have tried and tried to find out me information on the IMV job lead and I’m not finding anything! Can someone lead in the right direction and let me know where I need to go to apply for a position! Support.com pays their RSTs and MT reps 9.75 per hour plus .50 per hour for your expenses (internet, etc). Kindly anna suggest that how can we work from Pakistan…and how abt anyone ‘s experiance at work(appen Butler hill)???? Hi Sana, All my worldwide resources are located here – http://realwaystoearnmoneyonline.com/2014/12/where-to-look-for-worldwide-work-at-home.html. Higher One sold their customer care department to an offshore company. All customer care will be foreign by the end of 2015. Appen Butler Hill pays over $10 an hour for social media evaluation. I worked with them. Thanks, Felisha. I will get it added. Hi, I just want to inform you that in 2013 Appen Butler Hill used to pay 21$/hour for German speaking independent web search evaluators outside the US. I used to work for them and it was easy money! I can absolutely recommend this job! Do they do any other languages, like Portuguese? I am interested but i am sorry to ask are this jobs worldwide or only US? Awesome list! Really helpful, especially for someone like me who’s looking for supplemental income 🙂 Thanks for compiling this! Anna, thank you so much for writing this useful blog. Hi @Anna! Thank you so much for this writing this blog, and saving the hapless souls out of their misery. I had read about Lionbridge on one of your posts, and have applied there (waiting for work to start). After having gone through a multitude of scams, this was the 1st legit site I came across. Please keep on doing this!! How do you apply for these positions? Each link should take you to a full review of the company on this blog (another blog post) and that blog post should have a link to apply down toward the bottom. Lifebushido pays foreign workers $2.50 an hour. I was unable to find a reason for this discrepancy in pay. I wrote to owner/founder and flatly said I could not work for this rate and that other sites I work for pay based on competency, not location. I received no reply. I’m glad you posted this @Maria Fiallos! I too applied and got sent a whole load of materials to read through. I was shocked to find that little gem about Lifebushido paying foreigners $2.50 per hour. It’s beyond a joke! I didn’t even bother responding to them. What’s even more baffling is that they wanted me to do some market research in my country, under the guise it was part of the job application process! Yes… I’m actually pretty shocked as I was about to go through the same process… Clearly they are looking for workers from certain countries where the conversion rate works out to more… However where I am located… there is no way I could get paid $12 a week to work part time. That is basically volunteer work! They should really be ashamed that they are exploiting people who are clearly desperate for work. I feel disappointed as I read good reviews about this company from US based workers and thought it might be worth a try however looks like I will have to continue looking! In the Philippines, it’s $3.50 per hour. That’s so not worth it. I was thinking of applying, but no longer. I earn more at Rev captioning. I wonder if it’s because the Philippines has low living standards or because the third party’s local branch (ABH Phils) gets more than half of what the client company supposedly pays the website evaluator. Still, it’s not fair that compensation isn’t consistent across countries. So what if $13 goes a long way for a Filipino living in the Philippines? He/She still does the same work and spends the same time as his/her counterparts overseas. Thank you for this information. I am currently checking into at least 4 of the non-phone jobs.